What’s Up With My Life? Do you absolutely love your life? Is your life fulfilling and exciting with great relationships, perfect health, the ideal job, and filled with abundance? Are you having fun? If not, this book is for you! We are all born with a purpose-a mission in life, and when we know it and live it, life flows perfectly. 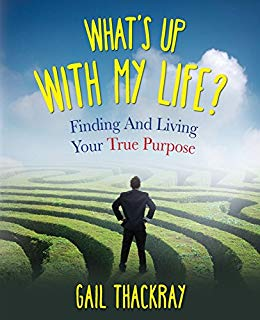 Author Gail Thackray guides you in answering: What is the meaning of my life? How can I identify my strengths and life tools? How can I more fully embrace my True Purpose? How can I turn my hobby into my dream job? How can I get rid of the blockages that are holding me back? Why do I keep repeating the same mistakes? How can I identify karma that may be holding me back? How can I have more prosperity in my life? We are meant to live our True Purpose in abundance. What is your passion, and what's stopping you from living your dream? What's Up with My Life? gives you practical tips and exercises for how to create a more fulfilling life.